Oct 1966: Faculty and Staff Prize, University of Waterloo, For achieving the highest standing in first year engineering. 2005-6-2: the Henry Kravitz Award for Best Teacher, awarded annually by the residents of the Department of Psychiatry of the SMBD-Jewish General Hospital. 1997-2007: I programmed a computerized Patient Information System for the Supportive Care Team at the SMBD - Jewish General Hospital. 1999: Handout for clinical teaching of the use of the Mini Mental State Examination (MMSE). Jul 2001: Consultant to St. Remy Media, publisher, on the content of their mini-guide "Getting Your Sleep" by Robert Labelle and Elizabeth Lewis. Nov 2006: To provide for better followup of behaviour problems and treatment results in elderly residents of Ste. 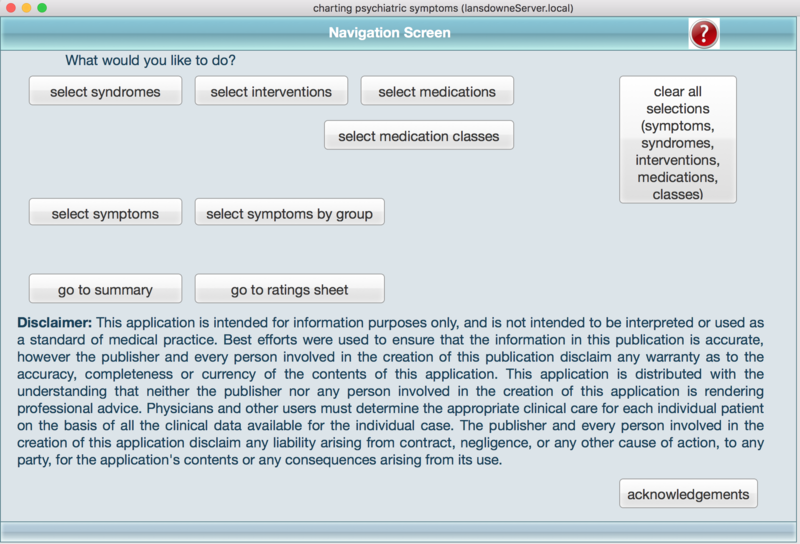 Anne's Hospital, I designed a form for use by nursing staff to record problem behaviours on an hourly basis. This form was officially adopted to become part of the medical record. Jul 2007: To provide for better detection of vitamin B12 deficiency in elderly residents of Ste. Anne's Hospital, I drafted and sent a memo to treating physicians about the correct reference range for methylmalonic acid testing. Memo. Apr 2008: Given the potential toxicity of lithium, particularly in the elderly, I drafted and sent a memo to treating physicians with recommendations for lithium monitoring. Memo. 2009: Reviewer for article "Comprehensive Assessment of Depression or Behavioral Problems in Long-Term Care" by Raymond TCM Koopmans, MD, PhD, Sytse U Zuidema, MD, PhD; submitted to International Psychogeriatrics. 2011 July: Reviewer for article “When ‘more is less’-the detrimental effects of increased sleep on mood and alertness following the winter daylight saving time transition” by Yvonne Harrison, submitted to the journal Sleep Disorders. 2011-present: I've developed a neural network based nearest-neighbour pattern classifier based on Hamming distances. A description as well as classification results with a number of publicly available datasets are posted here. The HammingNN classifier itself, programmed in Python, can be accessed here. 2012: Given that there is some evidence that low blood pressure in the elderly can cause frontotemporal syndrome symptoms, I adapted and translated into French the Frontal Behavioral Inventory of Kertesz A et al, to assist clinicians in identifying this syndrome: Modified Frontal Behavioral Inventory. 2012-present: The Confusion Assessment Method (CAM) is a standardized tool for the detection of delirium, for both research and clinical use. As scoring can be complicated, I have created an online version which calculates results automatically, using the LimeSurvey platform, in both English and French. Access it here. 3. Dietary methionine restriction has been demonstrated to be a robust intervention to extend healthy longevity in experimental animals. To facilitate dietary planning, I've created a Filemaker database incorporating the United States Department of Agriculture (USDA) Food Composition Database data on methionine content of over 5000 food items. 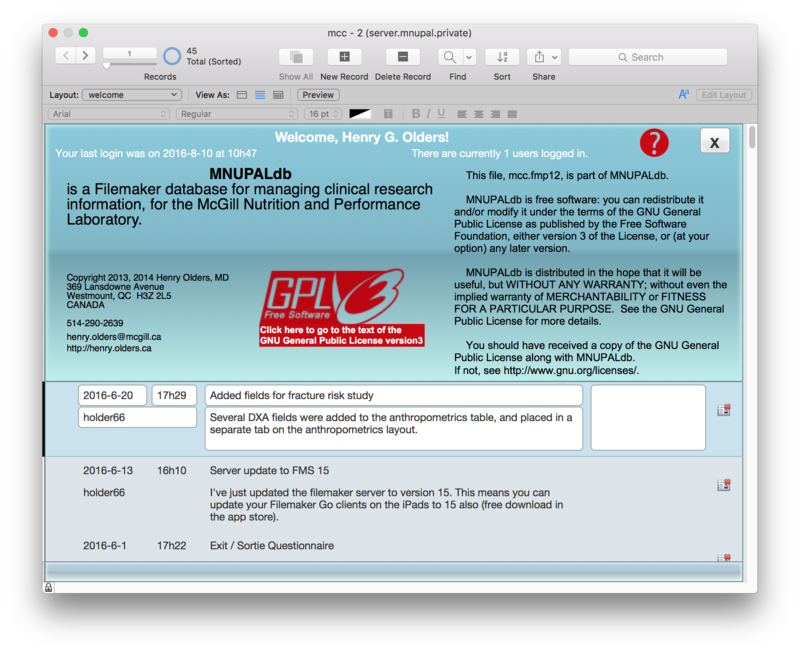 Besides methionine, the Filemaker database presents data on several other amino acids,anions, and choline. Predicted Renal Acid Load (PRAL) values are calculated using two different formulae. Bar graphs allow for visual comparison of data. Olders H. Mourning and grief as healing processes in psychotherapy. Can J Psychiatry. 1989;34:271-278. Olders H. Average sunrise time predicts depression prevalence. J Psychosom Res 2003;55(2):99-105. Olders H. Letter to the editor: Comment on 'Acute impact of immediate release methylphenidate administered three times a day on sleep in children with attention-deficit/hyperactivity disorder'. J Pediatr Psychol. 2009;34:108-9; author reply 110-2. Olders H. Comprehensive Assessments of Competence: A Psychiatrist’s Perspective. McGill Journal of Law and Health. 2011;5:283-286. Olders H: Patients, Families, Communities, and Clinicians: Bridging the Gaps. Canadian Psychiatric Association Annual Meeting, Halifax, Nova Scotia, Sept 1988. Olders H: A Computer on My Desk. Do I Have a Choice? Canadian Psychiatric Association Annual Meeting, London, Ontario, Sept 1987. Olders H: Mourning and Healing: Grief as a Healing Process in Psychotherapy. Canadian Psychiatric Association Annual Meeting, London, Ontario, Sept 1987. Olders H. Improved Detection of Vitamin B12 Deficiency. Poster presented at the Continuous Quality Improvement Day, Ste. Anne's Hospital, 2008-10-22. Olders H. Testing for Vitamin B12 Deficiency in the Elderly. Poster presented at the Research Day of The Health Outcomes Axis of the MUHC Research Institute and the McGill Division of Geriatrics, held on 2012-5-15 at the McGill University New Residence Hall. Sabrina Cesare, Irina Uscatescu, Jonathan di Tomasso, Lorella Ciutto, Kevin Yu-Chueh, Henry Olders, Nathalie Aubin, Mary Lou Kelly, Marta Jelowicki, Rabiaa Laroui, Rosemary O'Grady, Manuel Borod, Robert Kilgour and Antonio Angelo Luciano Vigano. Developing pathways for cancer rehabilitation in tertiary oncology centers: Initial observations at the McGill University Health Centre. Presented at the 2014 Annual Meeting of the American Society of Cancer Oncology, 2014-10-24. Olders H. What causes insomnia? WWW Edition: Last updated: 12 May 2003. Scientific American, Inc.
Olders H. Ask the experts: What causes insomnia? Sci Am 2003;289(4):103. Olders H. B12 and Cognition: What the Guidelines Don’t Say. Parkhurst Exchange, May 2011, pp38-44. Olders H. Why don’t today’s treatment approaches truly help people living with type 2 diabetes? Opinion piece, published on the Medical Post website, 2015-12-10. Duff V, Olders H. Negative symptoms in schizophrenia. Can J Psychiatry. 1990;35:570-571. Bishop M, Olders H. Alternatives to civil commitment. Can J Psychiatry. 1992;37:223. Olders H. Do PPIs suppress B12? [letter]. Parkhurst Exchange2001 November):7. Olders H. Re: "Sleepless in Canada" (August 2008) [letter]. Canadian Psychiatry Aujourd'hui 2008;4(5):22. Olders H. Was omega-3 research study burdened by pharma support? * [letter]. Medical Post 2008-5-23. Olders H. PPIs, B12, and falls. Comment on 'Use of proton pump inhibitors and risk of osteoporosis-related fractures'. Can Med Assoc J website, 2008-11-18.